Given how hot and arid Australia is, you need to be ready to manage irrigation under dry circumstances. Our best advice: know your crop, know how it responds to periods of drought, and know what tools are available for irrigation management. How do Perennial Pasture Crops Deal with drought? Perennial pastures are very sensitive to late irrigation start-up and missed irrigations. When irrigations are missed or even delayed, plants go into partial water stress, which leads to growth decline. Even once the stressed pasture is fully irrigated, there is a lag period before growth rates go back to normal. It takes several weeks for perennial crops to fully recover. You can avoid missed or delayed irrigation with the right irrigator. The GPI-100 Solar Powered Travelling Irrigator helps ensure you don’t run out of water and all your crops are irrigated properly with water pressure as low as 20psi. It’s ideal for smaller areas of land, like small farms, parks, gardens, nurseries, hobby properties, sports fields, race tracks, golf courses, equestrian stables and arena’s. 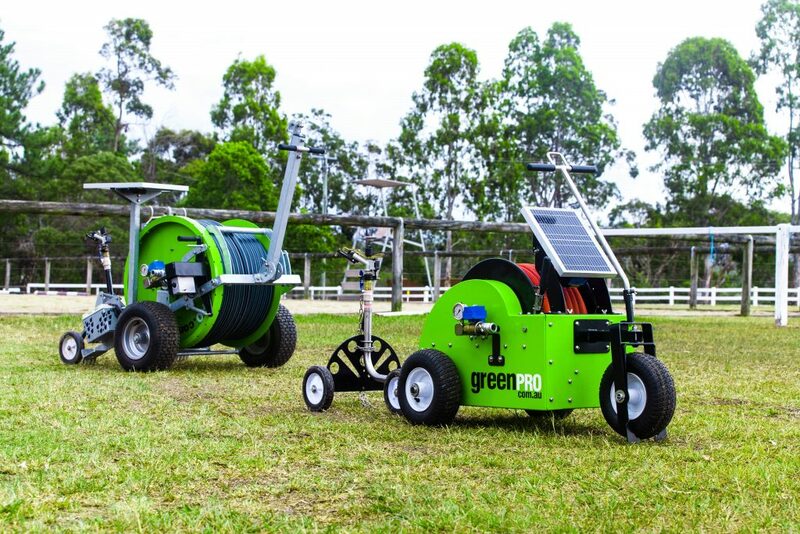 TIP: If you find yourself with reduced water supplies and can’t get your hands on a GPI-100 Solar Powered Travelling Irrigator, minimize the area of pasture you are irrigating, so that at least a portion of your land is receiving a full requirement of water. Do not continue to irrigate the same area of land with less water per hectare. This is a common strategy, but under-irrigating a large area just leaves you with a large amount of arid land. How do Forage Crops Deal with drought? Forage crops are more tolerant of delayed or missed irrigations. They also respond favourably and lucratively to once-off irrigations in the mid to latter phases of their growth period, so if you need to conserve water, there are ways to manage and still have your crop flourish. If your crops are decently damp, you may be able to stop irrigation in the summer and save your water for early autumn. Be careful how you store the water – dam or surface storage containers have a high evaporation rate, decreasing your total volume of water for autumn. Carefully weigh the pros and cons before stopping summer irrigation. Millets are quick-maturing summer cereals used in quality animal feed. These crops can be grazed 5 to 7 weeks after sowing. We recommend pearl millet or pennisetum millet, which have excellent drought tolerance, unlike Japanese millet. Cowpea is a multi-purpose legume that is an easy crop to establish, adaptable to a wide range of soils, drought tolerant, and provides high yields in a short period of time. Forage oats are a reliable winter crop that can produce high-quality feed at a time when most pastures are inactive. Oats are often used to fatten livestock during autumn to early spring. Annual ryegrass grows vigorously and is tolerant of drought, continuous grazing, low soil fertility, and even some insects. This crop is highly nutritious and useful for hay. Irrigated forage crops generally have better water use efficiency, as they tend to produce more feed per mL of water, compared to irrigated pasture crops. However, if you already have irrigated pasture crops established, it is likely not worth it economically to switch over to forage crops. Finding a proper irrigator for your needs is the most cost-effective route.